With sturdy all steel construction and compact design, the HP-121 is reliable and designed to fit virtually any retail environment. Under-counter mounting brackets for HP-121, EP-102N. Randomly keyed Locking Lid for the 1051-4, 4B4C money tray for the HP-121 and EP-102N series. Locking Lid for the 1051-4-4B5C insert, keyed alike, optional for the HP-121 and EP-102N series. 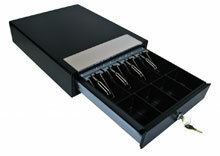 4-Bill/5-Coin nesting optional money tray insert for HP-121, EP-102N series.